Install Windows software in Ubuntu without virtual machine - Did you ever thought running Microsoft Office 2013 on Ubuntu Linux? For long time Linux user, you will not need this stuff. You could use Microsoft Office alternative that completely free ( e.g LibreOffice ). But most new Linux users is still looking for this way. Am I wrong? 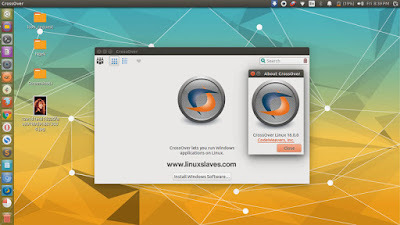 So today, I’ll show you an Ubuntu application that you can use to to run Microsoft Windows apps on Linux without using a virtual machine using CrossOver. CrossOver is a commercial software that lets you to launch Windows apps natively on the desktop, and integrates Linux functionality like cross-platform copy & paste and shared file systems to your Windows applications easily. This application runs Windows productivity software such as MSOffice, utility programs, and games all in one application without the overhead of a virtual machine, programs and games can run as fast or faster than they would under a Windows operating system. It supports all major Linux distros and Mac. What's New in CrossOver 16? 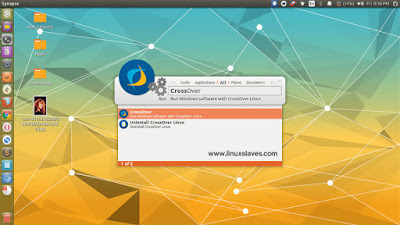 You can easily install CrossOver in your Ubuntu 14.04 LTS Trusty Tahr, 14.10 Utopic Unicorn, 15.04 Vivid Vervet, 15.10 Wily Werewolf, 16.04 Xenial Xerus, 16.10 XYakkety Yak and Ubuntu derivatives system e.g Linux Mint 17.1 Rebecca, 17.2 Rafaela, 17.3 Rosa, 18 Sarah, Elementary OS Luna, Freya, Loki and other Ubuntu derivatives. Alternatively, you can paste the link above in Linux download manager or clicking the link that provided below this post. The package size is around 151 MB. For those who prefer GUI based approach, you can install it using any Ubuntu software installer like Gdebi. Step 4 - Now open the the the app via Unity dash, Synapse Launcher, or other Ubuntu app launcher. You may needs to install additional packages when you're opening an application for the first time. It will open a new terminal window and ask you CrossOver needs your permission to install missing packages. So that's all I can write about the step by step installing CrossOver latest version in Ubuntu which is now add Microsoft Office and 64 bit Windows applications support. Thanks for visiting us!